Fernehalwes back again for another installment of the Developers' Blog. Recently, I?ve seen several people on the Lodestone forums express how cool it would be if, instead of pics, I could sneak a few music clips up on the blog as well. So, I donned my ninja garb, popped open a bottle of prism powder, and slipped into the shadows of the sound department?destination: FINAL FANTASY XIV sound director Masayoshi Soken's studio. Greetings earthlings! I now control the horizontal and the vertical. The Developers? Blog is mine, and by mine, I mean the personal property of one Masayoshi Soken?Japan?s number one fan of knee-socks?a.k.a. Knee-Soken! For those of you following my twitter feed (that would be all of you, I presume), you may recall a few days back I HYPOTHETICALLY asked that if I were to HYPOTHETICALLY leak a few of the HYPOTHETICAL tracks I was HYPOTHETICALLY working on for XIV, which ones would you HYPOTHETICALLY want to hear? Well, despite a few nay-sayers who claimed I didn't have de Balzac to follow through with my intentions, most of you were psyched about getting the chance to listen to some previously unreleased tracks. And so, I devised this ?omplex plan to lure project manager M into my sound lair and bend her to my will. But wouldn't you know it, Fernehalwes happened to drop by, so I guess this?ll have to do. Now that the blog is mine and I can do whatever I want, how about I start by leaking one of the tracks for Limsa Lominsa? Oh, and while I'm at it, how about these two tracks for La Noscea? Sure, they won't be officially released in-game until the 3rd phase of the Beta Test, but who's going to stop me? Mwahahahahaha! The soft breeze off the ocean, the endless blue sky. Ah, what I wouldn't give to escape from this stuffy office and steal away to a place like Limsa Lominsa, where I could fill my lungs with the salty air and listen to the gulls while sipping on a glass fine wine. If I close my eyes, I can almost feel the cool sea spray tickle my skin. The FINAL FANTASY Vocal Collection goes on sale tomorrow in Japan...and it will contain the full, uncut version of ?Answers? sung by the lovely Susan Calloway! That's right, the version you heard in the End of an Era trailer was only half the masterpiece! But now, for the first time ever, the song will be available to the public (outside of limited-edition sets sold at private shows, etc. ), and that means for the first time ever, the lyrics will be unveiled!!1! Silence! This is my blog, and I'll have none of your insolence! I was merely saying that it was the first time the lyrics would be released in PRINTED form! Ah yes, the CD! You can find out more about it here. But be careful before opening the site at work, unless you don't think your boss'd mind the silky smooth sounds. And uh... I guess that's all? Very well. You can have your blog back...for now. But one day I'll return. 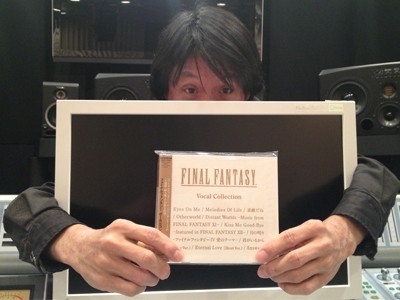 You won't know when, and you won't know where (though it'll more than likely be here), but mark my words, you haven't heard the last of Knee-Soken! Mwahahahaha! Number one fan of knee-socks? I'm gonna go out on a limb and say Japanese corporate culture is very different from American corporate culture. Not so much corporate culture, maybe video game corporate culture? Yoshi P is pretty flamboyant from a corporate perspective, he never wears suits, usually has a lot bling on, etc. I would expect he finds people who are more interested in expressing themselves than conforming to corporate standards, I imagine people at Pixar don't wear suits and ties either. The music for ARR makes me so giddy. On my fourth listen as I type this, lol. SE seems like such a fun place to work after seeing Ferne's blogs. I'm going to say that if the developers are having fun making the game, the odds of the game being fun to play are that much higher. Many failed software projects failed (including 1.0) because the devs were taking themselves too seriously, panicking, becoming overburdened with unreasonable deadlines, and generally suffering from miserable burnout. The dev team for 2.0 seems a lot happier and relaxed, probably because Yoshi P said "work hard and fast but don't be sloppy and if you need more time, ask for it." The enjoyable labour of like-minded people can either manifest as a Bastion or a Duke Nukem: Forever. And while it may not be the case here, sometimes it takes a disciplined crew willing to set aside their own personal attitudes in order to produce a concentrated realization of one person's vision. Regardless, it won't be much longer before we'll gratify all of our curiosities.